Help & DocumentationCreating ContentDatasets Comparing "Last Two Instances" / Track ChangesFilter combinations for comparing "Last two Instances"
Filter combinations for comparing "Last two Instances"
Datasets offer an easy and intuitive way to refine data when comparing history instances. This way, it is easy to know which rows have been added / deleted or changed. For introductory information on Snapshot Datasets and comparing data instances, refer to: Snapshot Datasets: Comparing "Last Two Instances" / Track Changes. To narrow the data to specific requirements / parameters, users can build sophisticated filters. This article provides a basic understanding of how to use filters when comparing instances. How to compare specific values for current and prior period (for example, compare sales made via a specific channel yesterday and day before yesterday)? How to add simple filters? How to add compound filter criteria? Filters allow defining additional criteria to compare current and prior values by various conditions. NOTE: Current and prior filters are shown only in the Track Changes mode. 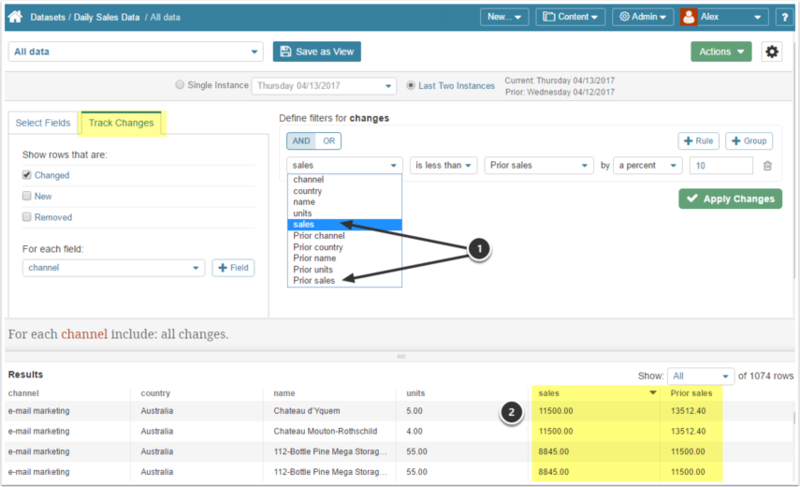 Results: Sales and Prior Sales columns are shown in the Results set and only those rows where the condition is met are shown. Use Case: Include rows if the sales in any country have increased by any amount over the prior day. Construct a Rule by selecting parameters for comparing current and previous values from the drop-down lists. You may add as many Rules as required to remove unnecessary data. You may create a separate View out of this data slice by clicking Save as View at the top of the page. Use Case: Include rows if units sold via 'website visit' channel have increased over the prior day OR if sales made via 'website visit' channel are 10% higher than over the prior day. 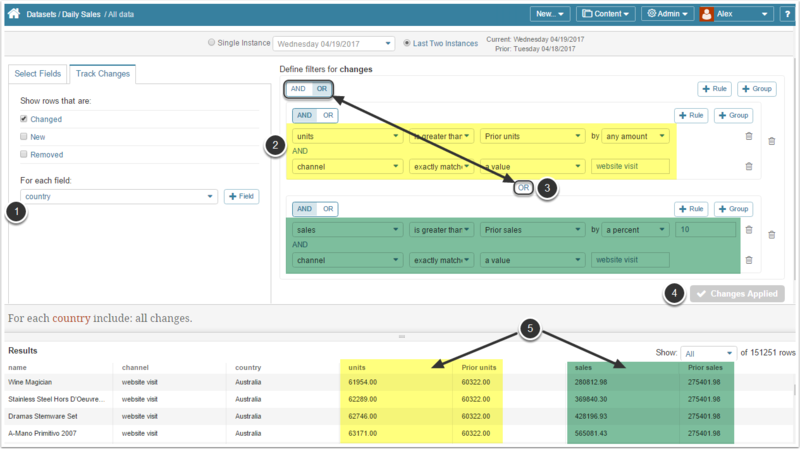 Identify the key fields across which changes will be tracked included in the Select Field list. In this example, you should select ONLY Channel, Country, units, and sales for inclusion in the display. Results: Units / Prior units and Sales / Prior Sales columns are displayed in the Results set and only those rows where the condition is met are shown.